The PRS SE Series continues to see significant additions in the 2018 model year with nine new models, growing on the huge strides made by the brand last year. For 2018, there is a striking new finish, extended range tweaks, an artist addition, a refinement of the SE Standard family, and PRS’s flagship guitar is adding a new look and a left-handed version. Designed around a finish offered by PRS in the late 80’s, the PRS SE Standard 24 Multi-Foil (or Multi-Metal back in those days) may be a nod to the past, but it keeps its striking, modern feel even a few decades later. Created by layering different finishes in a unique way, this distinctive finish has graced stages for decades –always commanding attention from the crowd. Sporting two 85/15 “S” humbuckers and a 3-way blade switch with push/pull tone control, the SE Standard 24 Multi-Foil has the tone to match its powerful look. The SE SVN (“Seven”) offers classic PRS looks, playability, and reliability. The Wide Thin maple neck and 26.5” scale length make the SE SVN addictive to play, and the 85/15 “S” pickups, modified for seven strings, deliver full, modern tone with clear, strong low end and clear, musical high-mids and treble. Topped off with coil-taps for the pickups and the PRS patented molded tremolo, the SE SVN is a pro-level instrument with amazing versatility and response. When on tour fronting the hard rock band Black Stone Cherry, Chris Robertson heavily relies on SE Series instruments. The SE Chris Robertson is a singlecut guitar with a mahogany back and maple top with flame maple veneer and a 22 fret, 24.5” scale length Wide Fat mahogany neck with rosewood fretboard. With a Soapbar in the neck position and a 57/08 “S” humbucker in the bridge, the SE Chris Robertson delivers old-school tone to match its classic appointments. The three-way toggle switch and volume and tone controls for each pickup, allow players to dial in a wide range of tones. The SE Standards from PRS offer some enviable appointments for their humble price tag, including versatile switching systems complete with coil taps and rosewood fretboards. New for 2018, PRS SE Standards now come with 85/15 “S” pickups, fretboard binding, and the PRS SE signature headstock logo. The SE Series began in 2001 with the goal of providing a quality instrument to players of all levels. This segment of guitars is meant to extend this promise to an even more affordable pricepoint. The PRS SE Custom 24 is the quintessential SE instrument, designed to faithfully reflect the PRS model that started it all. For 2018, PRS is adding two new veneer options: spalted maple and zebrawood. Both new veneers come finished in Vintage Sunburst, adding a distinctive new look while serving up classic PRS playability, reliability, and vibrant tone. The SE Custom 24 Lefty is another new model in the SE lineup, for left-handed players the world over. These new offerings for the SE Custom 24 keep the same foundational specifications as the SE Custom 24: maple top, mahogany back, Wide Thin maple neck, 24 frets, 25” scale length, the PRS patented molded tremolo, dual 85/15 “S” pickups with a 3-way blade switch and push/pull tone control for coil tapping. For complete specifications and a closer look at the 2018 PRS SE lineup, visit www.prsguitars.com. 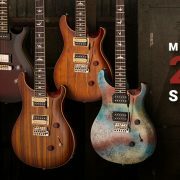 2018 PRS SE models are available across Europe now! http://www.prsguitarseurope.com/wp-content/uploads/2017/11/meet_the_2018_se_models_home.jpg 534 1200 Kieran Morgan http://www.prsguitarseurope.com/wp-content/uploads/2014/06/340-300x137.jpg Kieran Morgan2017-11-08 08:42:162017-11-08 08:42:162018 SE Lineup announced!